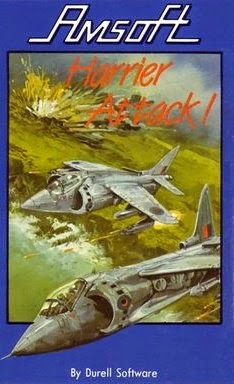 New CPC owners were often found playing parts of the bundled 8-pack of Amsoft games, and Harrier Attack is one, if not the best one. Yes it's crude, it's shaky, but it's also quite a bit of fun in short sessions. Harrier jump-jets have near impossible maneuverability in reality so putting one in a simple scrolling shooter didn't take much doing. Missiles and bombs ahoy, just get on with the mindless destruction, who cares if the visuals and audio are as basic as they can get. A fondly remembered early title for me, and proof that Amsoft did sometimes have a good un' in their lexicon.